It’s a welcome change for Clay, which had no Law School students on board just three years ago and which is only beginning to establish long-term relationships with the local legal community — unlike Adams, whose list of current and former coaches includes local judges and attorneys with ties to the Law School as well as students, faculty, and staff from the Law School itself. 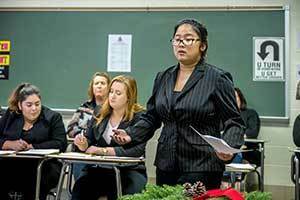 Law students and faculty have also traditionally helped coach mock trial teams at other local high schools, including Saint Joseph High School. Not coincidentally, expectations at Clay are high this year ahead of regionals later this month and the annual state competition in March. Clay High School Mock Trial teams scrimmage on an evening at Clay High School with Notre Dame Law Students in attendance to act as judges and give feedback and advice. Photo by Matt Cashore/University of Notre Dame. 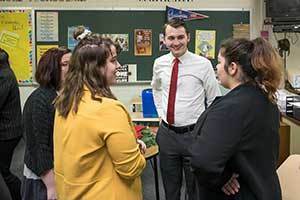 Notre Dame Law student Henry Leaman talks with members of the Clay High School Mock Trial team during an evening scrimmage at Clay High School. Photo by Matt Cashore/University of Notre Dame.